Hanoi (VNS/VNA) – Hanoi will be hosting its first Singapore Festival on March 23-24 with a wide range of cultural activities. The Singapore Tourism Board (STB), the Embassy of Singapore in Hanoi, and the municipal People’s Committee will jointly organise the event. Ambassador Catherine Wong Siow Ping said she felt happy to be hosting this festival because it would bring Singapore closer to the Vietnamese people, especially Hanoians. “This special event is an excellent opportunity to expand the cultural exchanges between the two countries, as well as to further strengthen the relationship between Singapore and Vietnam,” she said. The festival will be divided into different areas called tribes. At the Culture Shaper Tribe, visitors will enjoy art installations, cultural performances and films. The Rainbow Connection is a suspended display of solar light modules that explores the fantastical dreamscape of the deep sea, the woods and the clouds. As the modules gently rotate and sway in the wind, the sculpture seems to come alive. The light units are made from cookie containers and individually hand-coloured. 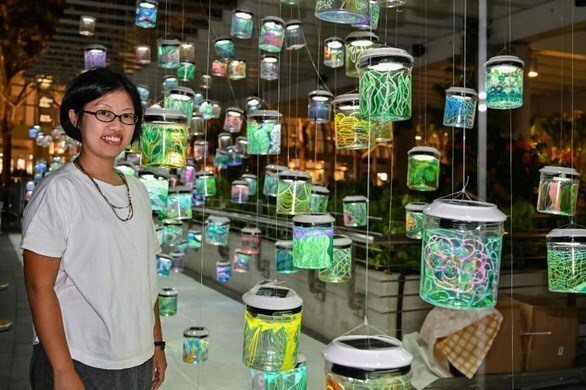 This artwork was exhibited at the iLight Singapore 2019, Asia’s leading sustainable light art festival, last month. Other artworks include S*GATTE – a five arched gateway inspired by the five stars that are present on the Singapore flag created by Speak Cryptic (Farizwan Fajari who was born in 1980 in Singapore); paintings Renaissance City and Second Coming created by Eugene Soh (1987) and Rubberband Land by Yellow Mushmellow (Aida). Local favorites from Michelin-rated restaurants like Hawker Chan and New Ubin Seafood to streetfood stalls will be presented at Foodie Tribe. Festival goers will have a chance to experience rice dumplings by Kim Choo Kueh Chang, popiah (fresh spring roll) by Kway Guan Huat and bak kwa (barbecued meat jerky) by Bee Cheng Hiang. Shopaholics will love the Collector Tribe with pop-up showcases of selected home-grown brands such as Design Orchard and Kim Choo Kueh Chang. Explorer Tribe will be offering tours through iconic key attractions, events and cultural precincts such as Chinatown and its blend of old and new, where historic temples, clans and traditional medicinal halls sit alongside hip new bars and lifestyle shops; Kampong Glam with charming boutiques, watering holes, cafés and gorgeous wall murals; and Little India, a buzzing historic area that shows off the best of Singapore’s Indian community. Socialiser Tribe will present music performances by the Singapore Indian Fine Arts Society (SIFAS), Open Score Project (a world music ensemble in Singapore that endeavours to perform unique syncretic music with influences drawn from various musical cultures in Singapore), the Wu Yue Dance Studio Arts Troupe and the Azpirasi dance group. Furthermore, a fringe event will be organised by the Pan Pacific Hanoi Hotel in partnership with STB. A Singapore Food Festival featuring limited portions from popular Singapore Food vendors and live demonstrations by Michelin-star chef Hawker Chan will take place on March 22. The festival was an effort to build a deeper connection with the people of the northern part of Việt Nam through the ‘Passion Made Possible’ destination brand, according to Sherleen Seah, director of STB Vietnam. “Close to 600,000 visitors from Vietnam visited Singapore last year. This was an 11 percent increase from 2017 and we are very humbled and honoured that Vietnamese people continue to find Singapore a preferred choice of travel destination,” said Seah.